With all the holiday entertaining I’ve been up to (read: dishwashing), my hands have been feeling drier and more cracked than usual. I’ve been a long-time fan of Mrs. Meyer’s dish soap and hand soap and always wished they had a matching lotion for a post-dishwashing treat. Well, guess what — now they do, and it’s amazing! Of course, it’s made with plant-derived ingredients and no parabens or phthalates. But the real reason I love it is that it makes my hands feel heavenly. After I do the dishes, I squirt one pump of this into my palm and rub it in (a little goes a long way). It sinks in right away, which means I can jump on my computer or go through the mail without getting grease everywhere. Thanks to the essential oils, it smells amazing too. You can choose from your favorite Mrs. Meyer’s scents and after months of cinnamon spice, these fresh scents make me want to clear out all the junk in our house and get ready for spring. I can’t help but catch myself sniffing my hands throughout the day! I’m so excited about this product that I had to share this offer from Grove. When you sign up using my link, you’ll get a free Mrs. Meyer’s lotion + kitchen set to help you get a fresh start on the new year. Even sweeter? The lotion is only available at Grove right now, so you’ll be the first to try it! It’s the perfect opportunity to treat yourself to a little pick-me-up for you and your home. Of course, nothing says “I’ve got it together” like a matching trio of dish soap, hand soap, and lotion sitting neatly by the sink. Toss the kids’ art supplies or homework stuff in this chic Grove Collaborative enamel caddy and, voila, you’re ready for last-minute visitors without breaking a sweat. Here’s one more thing that will make life easy: your subscription to Grove Collaborative. After all the holiday madness, I have zero desire to run to the store for a tube of toothpaste. 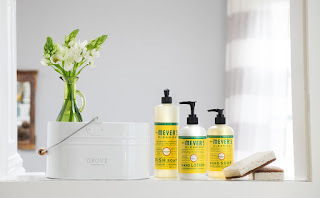 Grove hand-selects the best natural products (like this Mrs. Meyer’s lotion) and delivers them to my door, on my schedule — for less than what I used to pay at the grocery store. I can choose the products in my shipment and order at any time, but Grove also recommends a shipment schedule to keep me on budget and stocked up on essentials. It has saved me from many last-minute trips to the store for laundry detergent or trash bags. Saving money and going green? That’s two resolutions checked off right there! This Mrs. Meyer’s lotion is only available at Grove Collaborative and supplies are limited, so don’t wait! I’m excited for you to try it and see why I’m such a fan of Grove. 1. Sign up for Grove Collaborative here. You will receive the Fresh Start Kit for free when you sign up! If you’re already a Grove customer, you’ll receive a Mrs. Meyer’s hand soap for free with your next order. Tip to save: Once you’ve submitted your Grove order, you’ll be signed up for the free 60 day VIP trial. For 60 days, save even more with free shipping, free gifts, price matching, exclusive sales and personal service.